A popular open-source programming language, R specializes in statistical computing and graphics. It is widely used for developing statistical software and performing data analysis. The R community is known for continuously adding user-generated packages for specific areas of study, which makes it applicable to many fields. In this tutorial, we’ll go over how to install devtools and use it to install an R package directly from GitHub. Once these prerequisites are in place, you’re ready to begin. With these dependencies in place, we’re ready to continue. From within the monitor, we’ll use the install.packages() function to install devtools from the official Comprehensive R Archive Network (CRAN). Next, we’ll put it to the test as we fetch and build a project directly from GitHub. In this step, we’re going to install the latest development build of Shiny, a web application framework for R, directly from GitHub. We’ll do this using the install_github function provided by devtools. A GitHub package is defined by its author (rstudio) and its name (shiny) which you can find from the GitHub URL of the main project page: https://github.com/rstudio/shiny. Either of these will prompt you to save your workspace image, R’s working environment that includes user-defined objects. This isn’t necessary for our purposes, so you can safely enter n.
Since we’ll be using a web browser to look at an example of what Shiny can do, we’re going to make sure that web traffic is allowed. Shiny is a web application framework, so in order to view its examples in a browser, we’ll need to ensure that web traffic is allowed on our firewall. The built-in web server randomly chooses a port each time it is started unless we initiate it with a specific value. In order to make firewall management easier, we’ll specify port 4040 when we run our example. You may have other rules in place or no firewall rules at all. Since only SSH traffic is permitted in this case, we’ll add port 4040 and check the status when we’re done. With the firewall configured, we’re ready to take a look at Shiny. We’ll connect to R, this time as a regular user. Be sure to type R as title case. Shiny includes eleven built-in examples that demonstrate how it works. We’ll load the library, then run the first example. Because we are working on a remote server, we’ll specify the host address in order to browse from our local machine. We’ll also set launch.browser to FALSE so it doesn’t try to launch a browser on the remote server. We installed Shiny to illustrate using devtools to install directly from a GitHub repository. Then we ran the example Shiny application without elevated privileges to verify that all users have access to the package. For a production situation, we would install from CRAN unless we had a compelling reason to install from the repository. We can install the stable version with the following command, which will overwrite the installation from GitHub that we completed in the earlier step. The output indicates that instead of 1.1.0.9000, the version we installed from GitHub, we’re now running the stable release. Note: We can also find out more information about a package’s version from the system command line from its DESCRIPTION file. In this tutorial, we’ve installed the latest Shiny package directly from GitHub and learned how to reinstall its stable release from CRAN. 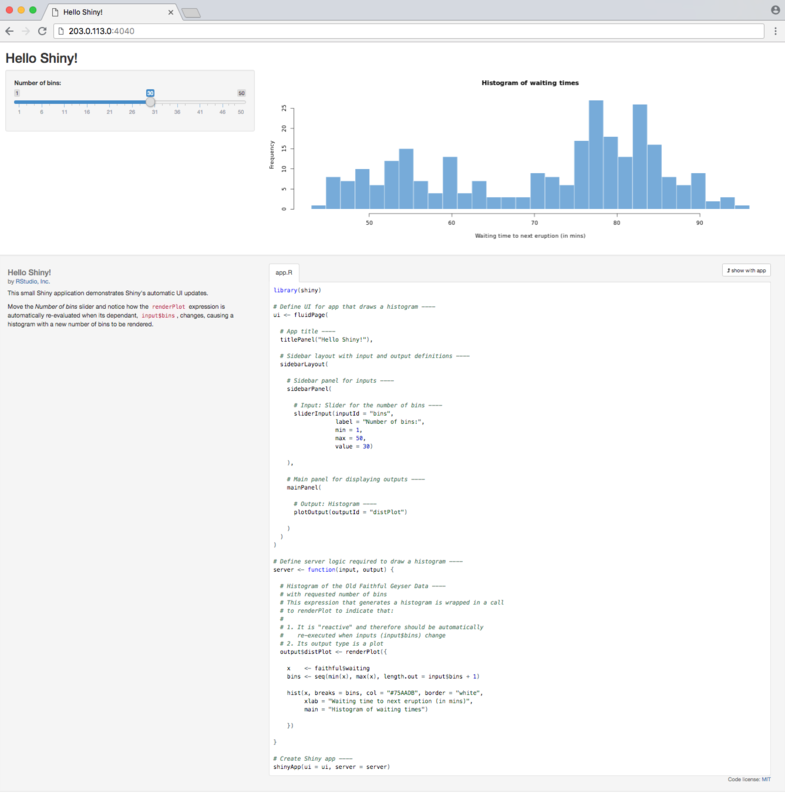 If you’re interested in learning more about Shiny itself, you can take a look at RStudio’s Shiny tutorial. You may also be interested in installing the open source RStudio Server, an interface to a version of R running on a remote Linux server, which brings an IDE to a server-based deployment.